for controlling the volume and effects of the instruments. Select track button. Click to select the channel. Double click to show the channel's instrument. Volume fader. Sets the channel’s playback volume. Pan / balance knob. Controls the position of the channel's output between left and right. Delay knob. Controls the channel's delay effect level. Reverb knob. Controls the channel's reverb effect level. Mute button. Mutes and unmutes the channel. Solo button. Solos and unsolos the channel. Delay Time knob. Sets the delay time. 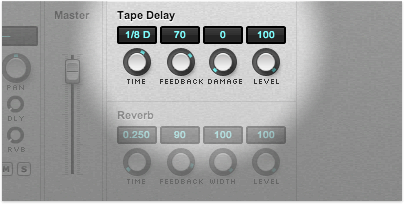 By default the effect is synced to tempo, but you can switch the sync off by clicking the delay time display above the delay time knob. 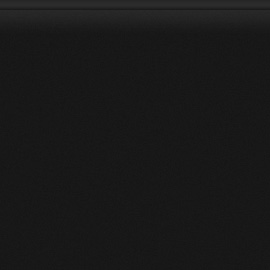 This will enable you to control the delay time in milliseconds. Feedback knob. Controls the number of how many times the delay will repeat itself. Setting the feedback knob to its maximum will cause the effect to repeat itself eternally. Turn the knob down to zero and you will only hear one echo for each note. Damage knob. Controls the overall vintageness of the delay. At the extreme damage settings the effect will smoothly overdrive and saturate the audio causing the delay to scream and self-oscillate. Delay Level knob. Controls the overall volume level of the effect. Reverb Time knob. Adjusts the size of the virtual room, changing the spacing between the reverb reflections. Feedback knob. 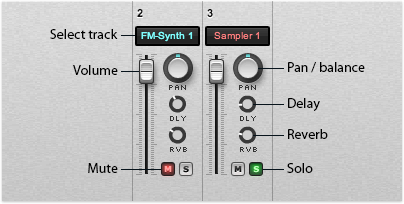 Controls the decay time of the reverb or the length of the reverb tail. Width knob. 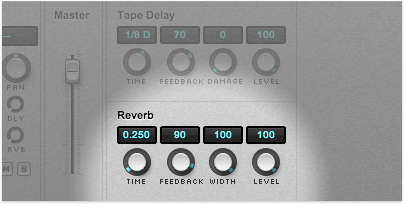 Widens the stereo image of the reverb. Reverb Level knob. Controls the overall volume level of the effect.